Mars Explorer Barbie launched today (Aug. 5, 2013) in time to celebrate NASA's Mars rover Curiosity's 1-year anniversary on the Red Planet. A new spacefaring doll from Mattel called "Mars Explorer Barbie" was released today (Aug. 5), just in time for the one-year anniversary of the landing of NASA's Mars rover Curiosity. The new doll represents Barbie's "2013 career of the year" and was developed with input from NASA. "Barbie consulted with the NASA EVA [extravehicular activity] Suit Team on the design of the doll, to ensure the Mars Explorer Barbie doll captured the spirit and style of space explorers," a Mattel spokesperson told SPACE.com via email. Barbie has had more than 130 careers, and this is not her first time flying to space. The doll donned a silver spacesuit in 1965, years before Sally Ride became the first American woman to fly in space. Barbie was an astronaut in 1985, and in 1998 she went to Space Camp. "Always a trailblazer, Barbie continues to take on aspirational roles while also serving as a role model and agent of change for girls,"the spokesperson said. "The brand has launched several dolls focusing on professions underrepresented by women, and specifically on STEM [science, technology, engineering and math] subjects, including computer engineer and architect." The doll comes equipped with an oxygen tank, helmet, boots and spacesuit all accented in her signature color: pink. 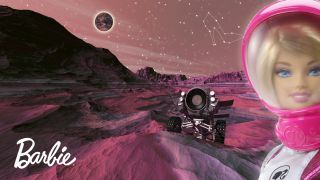 A pink-highlighted illustration of the 1-ton Curiosity rover can also be seen in the background art of her box. The back of the Barbie's box lists various facts about spaceflight and space science and asks the doll's fans to go to the Women@NASA website for more information. "Through the Mars Explorer Barbie doll — the '2013 Career of the Year' — Barbie hopes to introduce girls to the next frontier of space exploration," the Mattel spokesperson said.